Gene Yang talks with Publishers Weekly about his latest books, BOXERS and SAINTS, out this month from First Second Books: http://www.publishersweekly.com/pw/by-topic/authors/interviews/article/59000-video-gene-luen-yang-on-boxers-and-saints.html. 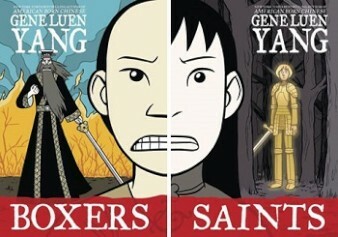 “Gene Luen Yang, author of the acclaimed graphic novel AMERICAN BORN CHINESE (shortlisted for the American Book Award), returns with two books that work in tandem: BOXERS and SAINTS. “In BOXERS, Yang tells the story of little Bao, a young Chinese boy who sees arrogant Catholic missionaries destroy Chinese religious idols and watches British soldiers brutally beat his father. He eventually joins the Boxers, who combined traditional martial arts training with mysticism, and believed that not only were they impervious to harm but that they could call spirit soldiers from the heavens to fight alongside them. “In the companion volume, SAINTS — the covers of both books are designed to combine in a beautiful graphic tableau when set face-out, side by side — we meet Four-Girl, a “devil” girl and misfit, always in trouble, who repeatedly sees a vision of Joan of Arc and converts, though, as in all things, for her own quirky and not completely pious reasons. Previous Post The New York Times loves RUFUS GOES TO SCHOOL, and so do we! Next Post BATTLING BOY by Paul Pope gets a starred review from Publishers Weekly !